Orange network status icon in bottom right. “Server is lagging” in status bar. If you open the Network dialog you will see the blockchain height disagrees with your selected primary server. 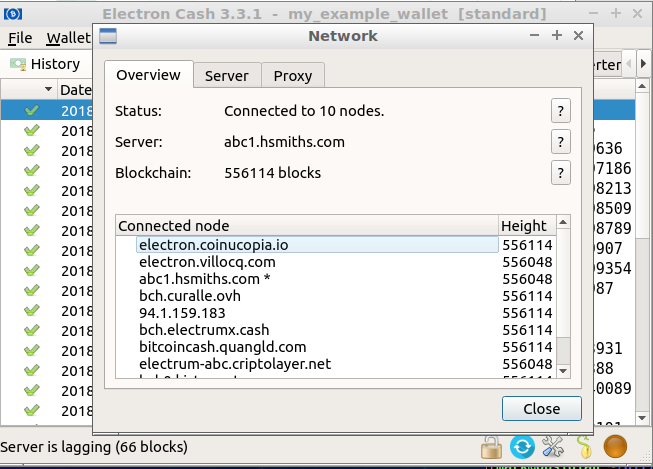 Electron Cash normally tries to switch away from lagging servers so you probably have not have noticed anything, however such switching would not occur if you have manually selected a server. If you are stuck on a lagging server, you will not see recent transaction history and transactions you make may fail to broadcast. It looks like Neil Booth (ElectrumX maintainer) has a fix in the pipeline and it should be released soon in ElectrumX 1.8.12. I will also keep the ABC/BU/XT-compatible ElectronX variant up-to-date. For now, affected ElectrumX server owners can work around the problem by simply restarting the software.